Russian rabbi of the sixteenth century; succeeded Naphtali Herz as rabbi of Brest-Litovsk about 1570. His signature appears in the "taḳḳanot" (ordinances) passed by the Council of Four Lands at the Gromnitca fair at Lublin (1587), with those of Solomon of Lublin, Joshua Falk, Samuel Edels, and other prominent rabbis. These taḳḳanot prohibit, among other things, the purchase of rabbinical positions or the securing of such positions through influence. 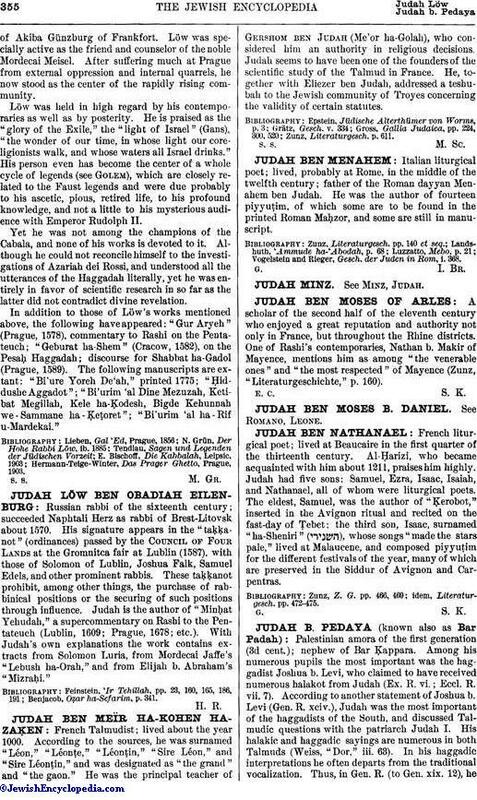 Judah is the author of "Minḥat Yehudah," a supercommentary on Rashi to the Pentateuch (Lublin, 1609; Prague, 1678; etc.). With Judah's own explanations the work contains extracts from Solomon Luria, from Mordecai Jaffe's "Lebush ha-Orah," and from Elijah b. Abraham's "Mizraḥi." Benjacob, Oẓar ha-Sefarim, p. 341.